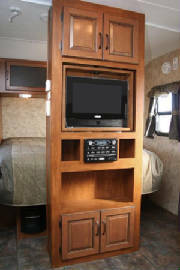 32" TV Install - An Englishman's RVing Experience. How to install a 32" Tv on the center console facing the living area. We decided that a mirror was not needed in this location. The Bigger TV gives a lot better view experience. 1. 32" TV or Smaller. Max height restriction 22"
2. 32" TV wall mount Bracket. (monoprice PID-7847 $25 inc shipping) or like. 3. 3 x audio Y-Cable (RadioShack $4:99) This will enable you to watch a DVD on either or both TV's. 5. 1 x 4' coax cable. 7. Very short coax cable for splitter. 8. Bolts 2" X 3/8 plus washer/locking washer and Nuts. 3. Remove 19" TV from mount locking bracket screw is accessible though hole in back. lay tv on bed. 4. Run second coax and power down though pipe and hole in board. Run any other cable that you may need (HDMI). 10. Drill two holes about 3/4 in from each side. 11. put bracket up with two bolts just in the holes. Then Make second hole on each side. 12. Take down bracket and drill second lot of holes. 13. Clean/vacuum up the mess 19" TV will still swivel. 14. 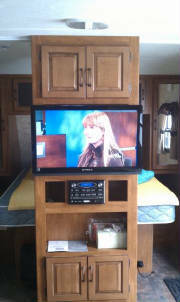 Lock 19" TV facing bedroom. 15. Install new TV bracket with bolts. 16. Measure and install brackets on back of TV. 17. Test mount TV and adjust if needed. 18. Have somebody install all of the cable on the TV and mount TV on wall Bracket. 19. Install coax splitter in cabinet at top. 20. Open a beer and enjoy the new TV.